Red Tea – Cinnamon and Vanilla. This infusion of rooibos with the addition of cinnamon and vanilla is made for lovers of sweet and delicate flavors. The tea is available in boxes of 20 tea bags – available in export packaging. The rooibos plant was discovered in the 17th century in South Africa by the local tribes in the Caderberg region, north of Cape Town. These tribes used all the parts of the rooibos in order to produce a refreshing drink which was aromatic and had medicinal benefits. 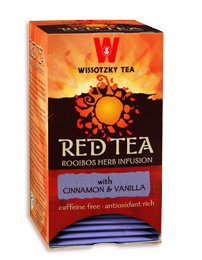 The name Rooibos comes from the words "red bush". The infusion which is produced from the rooibos plant is commonly known as a "Rooibos Infusion" or "Red Tea", though not containing tea at all. Today, red tea is popular and consumed in many countries worldwide. Red tea is well known for its health benefits and delicious taste. The flavor of Rooibos tea is often described as being naturally sweet and nutty and its color is rich red. Every sip gives the body a vibrant feeling. The rooibos infusion contains various minerals such as iron, zinc, magnesium and copper which help the metabolic system. Red tea contains no caffeine, colours, additives or preservatives and is highly rich in antioxidants which help protect the bodily immune system. Wissotzky tea produces 4 flavors of the Red Tea (Rooibos infusion): Red tea classic - The classic rooibos infusion without any additives. Red tea Cinnamon Vanilla – for those who like a gentle, sweet taste. Red tea Chamomile lime & honey – a mixture of sweetness and sourness, together with the soothing effect of the chamomile plant. Red tea Hibiscus & Passion fruit – for those who prefer the taste of slightly sour fruits.